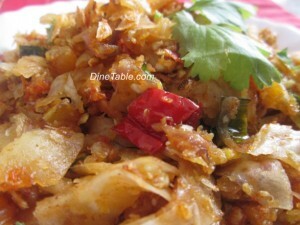 Egg kothu parotta A.K.A Minced parotta with egg. Paratha is a traditional Indian food item. Egg kothu parotta is made by tearing porotta into small pieces and then mix with onions, eggs and masala powders. ‘Kothu’ means chop the parottas into small pieces. It can be used as a teatime snack or nalumani palaharam. This is a spicy and delicious food item. Try this simple recipe and enjoy! Heat vegetable oil in a big non stick pan and add chopped onion, chopped green chilly and saute it on medium flame for 4 minutes. Add ginger garlic paste and mix well. Add red chilly powder, turmeric powder, pepper powder and mix well. Add chopped tomatoes and saute for 4 minutes. Then add eggs to this mixture and scramble well. Cook for 5 minutes. Add the chopped parotta and mix properly so that parotta is blended well with the egg. Add required salt and stir well. Add garam masala powder, lemon juice and chopped coriander leaves and mix well. Remove from flame. Tasty Egg kothu parotta is ready.